Patented direct thermal WhisperPrint™ technology eliminates print ribbons for maintenance-free operation. Using Lathem's E8 series time cards the model 2100HD delivers a quiet, perfectly aligned punch on each employee's time card. The 2100HD gives you the options to print the Day of Week or print the Month and Date in a variety of different time formats. The 2100HD time clock is made of heavy-duty steel and ABS materials that allow it to withstand harsh environments and high cycle volume use. A large high-contrast LCD displays time and date. The automatic print activation makes for fast and simple one-hand operation. 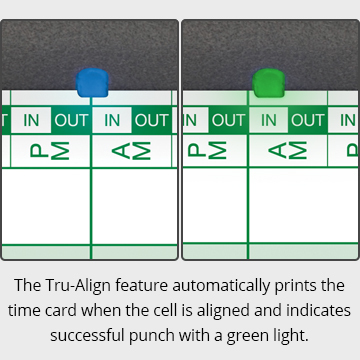 Tru-Align technology senses when the time clock's printer is aligned correctly with the proper space on the time card and only then will it automatically trigger an imprint. This ensures that your employees make the perfect-punch on their time cards every time. The 2100HD time clock includes EZSet technology. An innovative rotary knob lets you setup print formats, set time formats and select English, French or Spanish language settings all in less than 5 minutes. 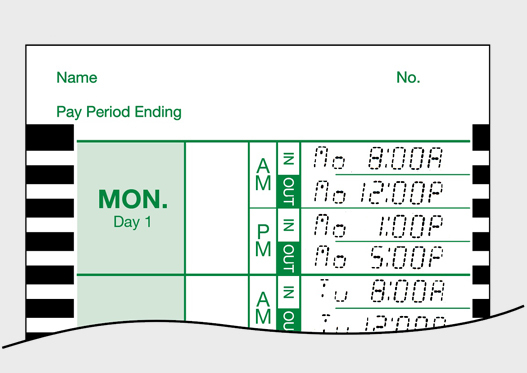 The model 2100HD lets you choose to print the Day of Week or print the Month and Date along with the time on employees' time cards. You can select print the time in 1-12 AM/PM hours or 24 Hour format and print regular minutes (0-59) or hundredths of an hours (.00-.98). Select your language preference and print in English, Spanish or French. User Friendly and Quiety. I love this clock. We had another Lathem different but always problems and noisey. Very Pleased with our Purchase Works well, delivery was prompt as always. Excellent for our shop with lots dust, dirt... continues do well. best part battery back up, no more ribbons. YES!! win, win! !